Annual air conditioning maintenance is one essential spring upkeep job. Spring is here. The warm weather may not be, but cooler temperatures usually hang around early in the season. But the arrival of spring is a sign that it’s time to prepare our homes for the arrival of warmer days. Annual air conditioning maintenance is one essential spring upkeep job. We recommend you arrange for maintenance from an HVAC professional as early in spring as you can, since this gives you extra time before the weather warms up. You can also take advantage of the less busy schedules of HVAC technicians to arrange for maintenance on a convenient date. We know homeowners are busy during the spring, and there are numerous jobs to get done before summer arrives. That makes it easy for a chore like AC maintenance to slip through the cracks. But AC maintenance doesn’t have to be a chore—in fact, all you need to do is call Tuckers and schedule an appointment, and our experts will take it from there. You won’t have to think about AC maintenance again until next spring. Keeping up with annual maintenance will lower the number of times you’ll need to call air conditioning repair in Germantown, MD. Around 85% of the repairs an AC might need during its service life are due to lack of maintenance. You can expect a longer service life from your air conditioner if it’s inspected and tuned-up yearly. Without regular maintenance, the lifespan of the average central AC can drop by half. That means an air conditioner that could last 15 years may only last 7 or 8. Maintenance helps a cooling system remain energy efficient through most of its service life, rather than lose 5% of its efficiency rating each year. 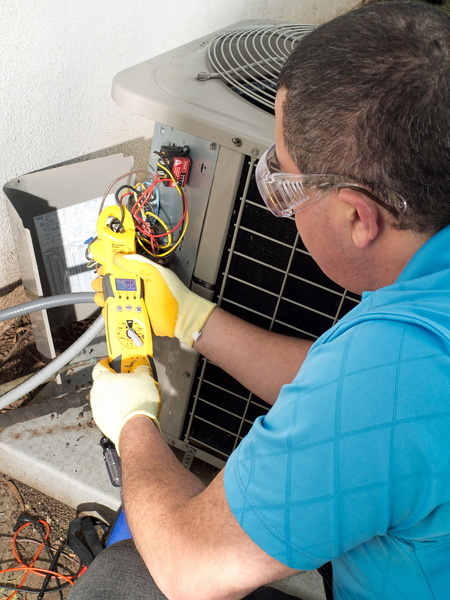 Annual maintenance protects the warranty on an air conditioner. This way you won’t have to pay a large amount for a repair or early replacement due to a factory fault. Knowing you have a dependable air conditioning system to back you up during the hottest days of summer is perhaps the best benefit of keeping current with maintenance. What better way to enjoy the summer than with peace of mind? Priority service—you’ll usually get same-day service! We offer a 100% money-back guarantee for 60 days—that’s how strongly we feel about USA Club membership. Schedule your AC maintenance with Tuckers Air Conditioning, Heating & Plumbing. We offer free estimates on replacement equipment and free second opinions.